When and how do I monetize my new blog? If we had a dollar for every time we heard that question here at EBA headquarters, we’d be hanging out on an over-water hut somewhere in Tahiti, sipping Mai Tais while we watched the sun go down over the Pacific! Seriously though, questions about money are almost as common as our 3 pm chocolate cravings. So many of you wonder when to monetize, how to do it, when to do it, what price point to use… the list is endless. 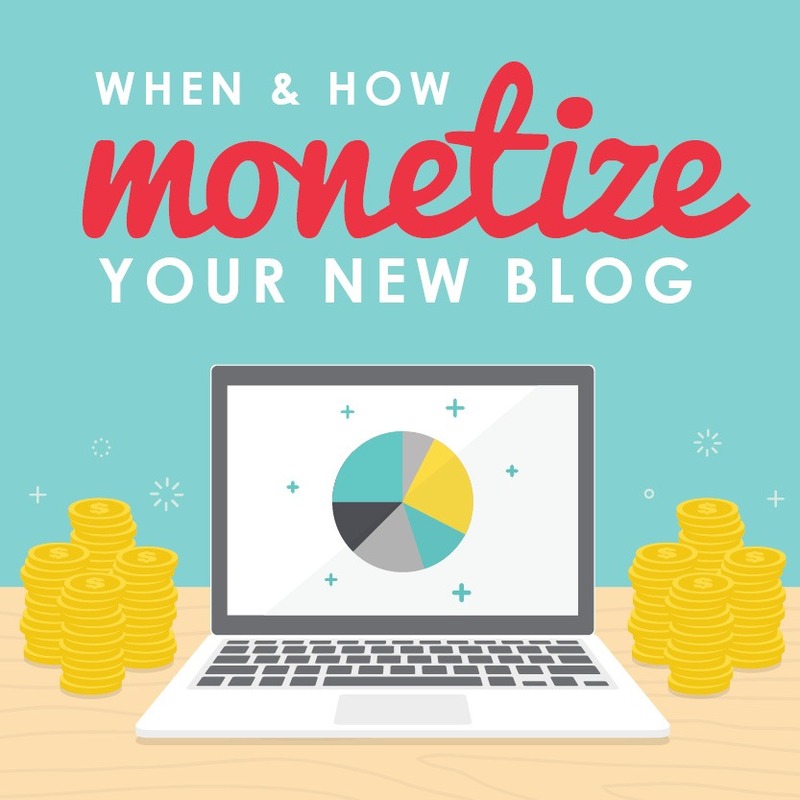 So, whether you’re new to blogging, or already a seasoned pro in need of a refresher, we thought that today we thought we’d go over exactly where you should begin when it comes to monetizing your blog. That said, it is very important to note, you have to do a lot of legwork before money even comes into the equation. You’ll need to get clear about your message, and then build up enough traffic to even warrant monetization. And, just so you know, none of that happens overnight! This means that as much as you may want to start bringing in income right of the bat, you need to take the time to make sure your content, design, and traffic are up to par before you set your sites on monetization. However, before getting into the nitty-gritty, it is also vital to note that every blog and blogger has a slightly different spin, market, and target audience. What works great for one blog may be a disaster for the next, sometimes even within the same target audience. Before you create a plan of action for monetization, take into account your own target audience. Ask yourself…What are their needs and concerns? What are they already asking you for? Asking these questions will help you decide how to monetize, from the ads you want to host on your blog to the certain kinds of companies you’d like to work with. Check out our 7 Surefire Ways to Boost Your Blogging Income Overnight to get a little more in-depth on the topic of earning money from the audience you already have. network to place their ad on your blog. Signing up is generally pretty straightforward and easy, but most companies do have an approval process that the vet applicants through. views, or some sort of combination of those two things. page views. Another downside to consider is the fact that you have zero control over how the ad looks, so it may be totally out of line with your current website’s design. Affiliate sales are a great option for promoting products you naturally would have written about anyways. For example, if you blog about natural remedies and write a lot about curing ailments with essential oils, then it is only natural to sign up as an affiliate of your favorite oil company to start bringing in money whenever people buy through your link. If you are unsure if the company you want to represent has an affiliate program, we suggest that you always reach out to them via email or phone because it never hurts to ask. private ads; others handle ad sales themselves. sponsorships, or paid product giveaways. Private advertising is also another great way to let your readers about a product that you personally use and support and that is on-topic for your blog. If you write about pets, and you have a certain leash you love, then it doesn’t hurt to reach out to the leash company to see if they’d be willing to sponsor a post or a giveaway or any of the other methods we suggest above. Selling products on a blog can include selling everything from original e-books or e-courses to handmade items, or even blog promotional items such as t-shirts, tote bags, and bumper stickers. This is different from affiliate advertising in that it involves selling your own products rather than someone else’s. Selling a product could also include selling or marketing a service. Depending on your blog niche, this could include everything from hosting local classes and services (such as coupon classes or professional organizing or party planning) to online consulting services such as virtual home decorating services. This could also include social media consulting or virtual assistant work for other bloggers. platform that can then be used to launch a traditional writing and/or speaking career. Traditional publishers will often not even consider a book proposal if the author has not already established an online presence. Likewise, many successful speakers get their start by first writing a popular blog. While becoming an author or speaker may seem like a different avenue of monetization, the reality is that books and speeches are just another type of product. And I guess that brings us to the final question….are you ready to start monetizing? The truth is that there is no set point where it is okay to start monetizing, just know that if you haven’t done the legwork of refining your message & making your blog a place worth visiting, and if you aren’t yet getting any traffic, you’re going to have a hard time making any money. It’s better to focus in the beginning on nailing down your content, writing quality articles that people actually want to read, and then driving traffic through SEO and social media, while you work on building your email list. Keep in mind too that any ad networks and affiliate programs do have traffic or page view minimums, so you may want to set your own traffic targets accordingly. And when it comes to launching your first product, we think it is a good goal to have at least 500-1000 quality subscribers on your email list! Just remember–blogging is a marathon, not a sprint. If you start with a firm foundation–an audience of raving fans that can’t wait to hear what you have to say–then monetizing is the easy part!